Take a Bite of These! Talking of large brands hesitant to try new things in this economic climate, Land Rover Dubai had something else in mind. 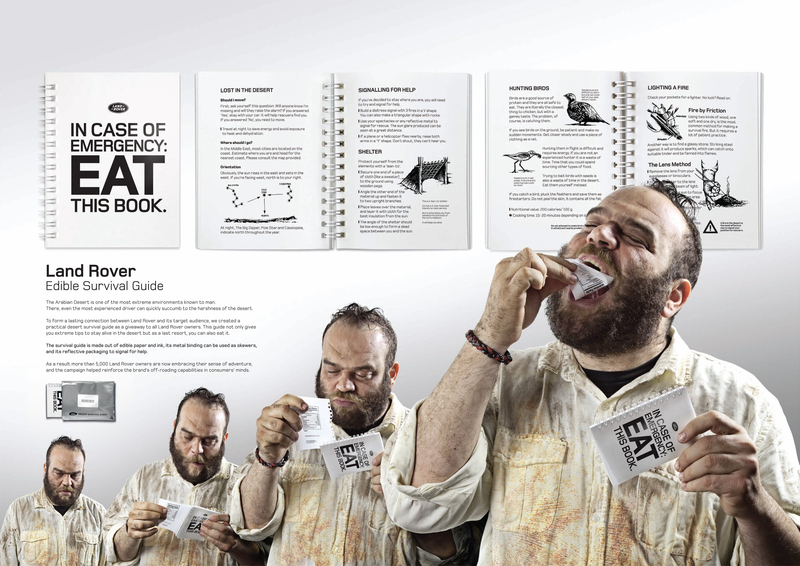 Their survival guide doesn’t just explain how to survive in the Arabian desert, it also offers the reader to truly digest their information – with the nutritional value of a cheeseburger. It’s just nice to see a big brand that stands for adventure be adventurous and communicate with their brand essence written all over it. It’s a simple idea but wouldn’t really be suitable for many brands. Use it for Land Rover, and a bit of marketing magic happens. I think this is what I am struggling with when brands suddenly venture into areas that don’t seem to gel – I am still coming to terms with the Kelloggs handbag. Any news on that one? Bunting at Turnpike Lane. Just simple and clever. Another really nice piece of creative is the latest Banksy design – assuming it is him. Ready for the celebrations, it’s just a simple and sweet statement that makes me believe in the power of creativity. Whichever way you look at brand communications and marketing today, there is no real reason why advertising, social and print can’t be extraordinary. It may be a step in the dark, but a mixture of understanding what a brand is about and great creative ideas to get the brand personality across to the nowadays pretty demanding consumer usually pays off long-term.